Parts Used: used for erosion control, browsing and as decorative plant. Blue grama grass is a warm season tufted perennial grass. It is native to the short and tall grass prairies, and makes up 75% to 90% of the grasses found there. The prairies lie in central North America. Cold artic air currents blow in from the polar regions in the winter. Summers are hot and dry because the prairies lie in the middle of the continent, and don't get moisture from oceans. Blue grama can grow up to 18 inches tall. It grows as a bunch grass, forming open sod mats. As it matures and is grazed on by animals, the bunches grow together and form the thick sod. 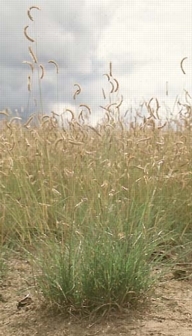 Blue grama is an important prairie grass because its dense, shallow root mass holds down the soil and keeps it from blowing away like it did during the Dust Bowl Era in the 1930s. Because the root system is shallow it can quickly absorb any rain that might fall. Blue grama is 6 to 12 (15-30 cm) inches high. It has flat leaves that come to a point at the end. The leaves can grow from 1 to 10 inches (2.5-25 cm) long and 1/8 inch (3 mm) wide. The flower stems grow 7 to 18 inches (17-46 cm) tall. The flowers look like crescent moons perched on the end of the flower stem. A flower consists of 20 to 90 little spikelets. Blue grama flowers from June to August, depending on what part of the prairies its growin in, and how much moisture it gets. When plowed under, or otherwise disturbed, it can take blue grama grass as long as 50 years to re-establish itself. On the prairies blue grama begins to grow late in the season, mid-April, when the soil is about 52° F (11° C). Blue grama goes dormant in the winter, and when there is a drought. Blue grama likes to grow in full sun with well-drained good soil, and can stand drought, heat, cold, and mowing. Although it doesn't like shade, it can grow in open piñon forests. People use it instead of regular grass where there are dry areas, for grazing animals, and to control erosion. Some people use the flowers in dried flower arrangements and the plant is also used in rock gardens. Loewer, Peter. (1995). Better Homes and Gardens Ornamental Grasses., Desmoine, Iowa: Meredith Books, Round Table Press, Inc.
Loewer, Peter. (1988). Ornamental Grasses - Brooklyn Botanic Gardens. Ed, Barbara B. Psch. Brooklyn, N.Y: Editorial Committee of the Brooklyn Botanical Gardens, Inc.
Weigel, Martene. (2000). Encyclopedia of Biomes. Gale Group. World Book Encyclopedia, ed., The Plant World. (2000). Chicago. Ill:World Book , Inc.